Bringing mobile coffee to your clients is always a good idea, and in partnership with branding, it truly makes for a winning combination. So why not capitalise on the offer of a free coffee by maximising your exposure to them while they wait for their hot drink. Below is the other branding options we currently offer if there is something not listed please let us know and let us see what we can do for you. Branded cups or Sleeves are a great addition to any promotion. we usually do 8oz cups however we are able to offer 4oz branded cups for sampling promotions too. 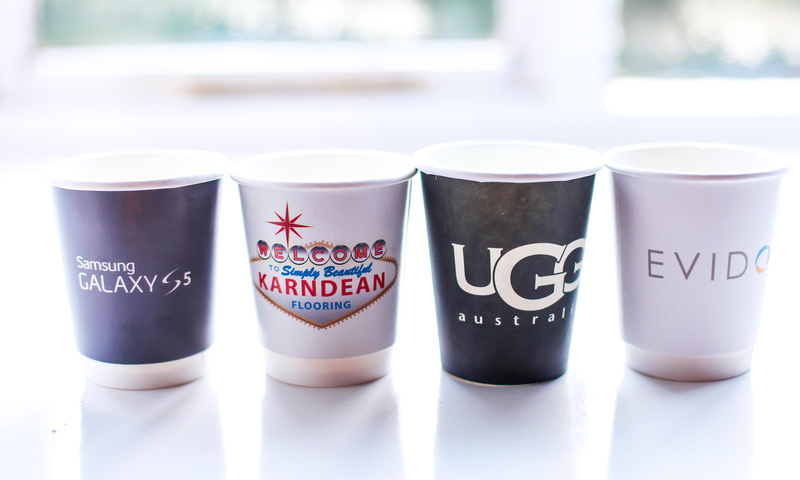 We are able to offer no minimum order on branded cups. The lead time for production is 10-12 working days, however faster turnaround may be available, please contact us for a quote. A table frontage sign can have a big impact! A custom coffee stencil adds a sleek touch to our creamy cappuccinos and hot chocolates and from our experience, can make a big impact on your client! Branded biscuits can add a bespoke flair to your event and promotion. Contact us to discuss your requirements and we can give you a tailored quote. So whatever your branding requirements, let us know and we can make your coffee campaign reach new heights!